Witness how the big sea turtles lay their eggs at the seashore. A local taboo provides sea turtles traditional protection. They are revered to as gods in the lives of the local people of Ada and are therefore not to be touched, killed or eaten. However, some non-natives of Ada living within and near Ada to whom sea turtles are not their totem poach nesting sea turtles for meat or sale. To prevent the turtles from being killed, the local Wildlife Division takes up measures such as night time patrols and surveys, research and relocation of threatened turtle eggs and rescuing of threatened turtles. Every year from August to February the Leatherback turtle, Green turtle and Olive Ridley turtle lay their eggs at the seashore. The main nesting areas are the islands/sandspit between the two estuaries and beaches westward of the estuary. Visitors can witness this fascinating sight of the huge turtles coming out of the water and nesting in the sand. 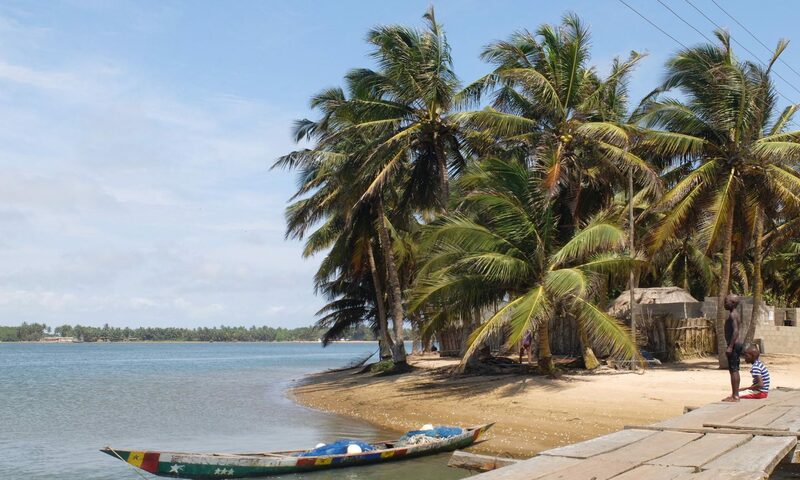 Watch monkeys early in the morning on one of the islands in the River Volta. You have to get up early to see the monkeys (Spot-Nose monkey and Green Monkey) on so called “Monkey Island” in the Volta River. During the day they stay away from the villages and retreat far into the woods, but if you manage to arrive around 6.30 a.m. you can watch them from one of the watchtowers that were built for this purpose. A major project by international organizations started establishing ecotourism on the island some years ago. One of the aspects was to create alternative sources of income to promote the conservation of the monkeys. Though the place might need some maintenance, it is very beautiful and special to walk along the thick forest path early in the morning. For more information and booking of the tour please contact the Tourist Information Center. Visit the winter home of thousands of migratory European birds at the Songor lagoon. The Songor lagoon is an area of international importance as it hosts thousands of migratory European birds wintering in Ghana. The lagoon provides feeding, breeding and resting ground for over nearly one hundred migrant and local birds such as pygmy cormorant, curlew, gulls and terns, plovers, greenshank, sanderling, black-winged stilt, etc. The best time to watch birds is towards the dry season (August to Febuary)– the European winter, and in the early morning or late afternoon. The Wildlife Division regularly monitors the distribution and abundance of bird in addition to some water parameters in the lagoon. Take a tour with them to the boardwalk in the Songor lagoon, watch and identify different kinds of birds with binoculars and field guide and let the tour guide tell you interesting stories about the birds you see. If you want to see some really big birds go to Dedukope Ostrich Farm, located close to the border of the Dangme East District. They have some hundred ostriches living in enclosures whose meat is sold to restaurants. You can walk along the enclosures and have a look at the giant eggs. It’s a bit difficult to get there, there is no established tour so far and the only information you get is from the watchman or the taxi driver (a small tip is appreciated for the visit). How to get there: take a Tro-Tro to Sege and a taxi from there to Dedukope (there is no public transport between Sege and Dedukope). If you travel in your own vehicle go to Sege, turn right (coming from Ada) onto a paved road and after some kilometers turn left to a dirt road. The entrance is located on the left after driving about 6 km (there is no sign). Local snakes and crocodiles can be visited at the Community Zoo near Big Ada. Samuel Kabutey Kabo caught his first snake when he built a well some years ago. He went to town to get some supplies and accidently ran over a Cobra with his bike. The snake got very angry and followed him back to his house where it fell into the half-finished well. Samuel’s first instinct was to kill the snake, but the Wildlife Division told him that he should keep it and show it to the people to educate them about local animals. That is how the community zoo started. After the Cobra Samuel also caught some pythons and crocodiles that can all be visited at the zoo. After visiting the slightly run-down zoo he is happy to show you pictures of his animals and especially the skin of a python that hangs on the wall of his house. Crocodiles and aligators are common in the area and can be visited on one of the islands. There used to be a great number of crocodiles living on one of the islands in the river. But increased human activities drove them away. Crocodiles and aligators are still around in the district and it is not uncommon to see one on the rivershore. If you want to see them for sure you can visit Pediatorkope island where a couple of crocodiles live in a small walled cage. There is no tour to visit them, but any boat operator will take you there if you want or just rent a canoe and paddle there yourself.